What can we Learn From Tying Tzitzit? The Hebrew noun [tsiˈtsit] ציצית‎ is transliterated most commonly as tzitzit, with a variety of other transliterations including tsi’tsit or tsitsith. The Biblical and Middle Eastern pronunciation of the word is ṣiṣith; And the Yiddish pronunciation is tzitzis. The word tzitzit is the name for specially [knotted] ritual fringes worn by Torah Observers [on the hems/wings/fens/edge of their garments]. The word may derive from the semitic root N-TZ-H. The ending -it is the feminine adjectival suffix, used here to form a feminine singular noun. The original meaning is a “tassel” or “lock,” as in the Book of Ezekiel where Ezekiel is picked up by an angel and carried by a “lock” (Hebrew tzitzit) of hair. In English-language academic texts on Judaica the term is sometimes rendered “show-fringes.” In the Hebrew Bible the use is singular, but the feminine plural tzitziyot is found in later texts. The Septuagint translation is “tassels” (Greek plural kraspeda κράσπεδα, from kraspedon κράσπεδον singular). There are many Rabbinical customs on HOW to wear the tzitzits including but not limited to tzitzits being attached to the four corners of the tallit (prayer shawl) and tallit katan (vest undergarment), tzitzits being worn on four corners of belt loops, four extremities such as two on pants and two on shirt sleeves, etc. Now that we’ve got that out of the way, let’s look at what the Word ACTUALLY SAYS about these tassels. These are the ONLY COMMANDS dealing with the tassels. Let’s respond to the misconceptions. The only instructions that we HAVE to do is what the Word says. Everything else is simply suggestions/commentary. A BLUE thread/cord is mandatory. Along with the blue, we can add any other color. It does NOT HAVE to be WHITE. The word for blue in hebrew is tekheleth, used 48 times in the tanakh, meaning a cerulean muscle. This muscle (that is unkosher to be exact) is used to create a blue dye, yet it’s used for blue. Many Rabbis would mandate that the thread be MADE out of cerulean muscle, although that is not mandated Scripturally. An example to back up this statement is the word in Hebrew used for crimson/scarlet which is shani. Shani comes from a certain unkosher bug, coccus ilicus, which is commonly known as Red 4, used in food products to make food red and render the food unkosher. Another misconception is the FOUR CORNERS. The Hebrew word for corner is pinah as opposed to kanaf which is in the instructions for wings/hems of the garments. It is also still retained in Arabic as wing, but whether or not Arabic uses the word kanaf for the extremities of the garment as Hebrew does is unknown to me. Furthermore, the tassels were used as a sign of remembrance to FOLLOW/DO the commands. With that being said, it wouldn’t make sense to wear tassels on one’s behind as they cannot see them. The only purpose the tassels serve for being on the back/behind would be for others to see them, which in turn could become a ministry opportunity. Similarly the threads tend to be made either of wool or of the same fabric as the garment due to the command of not trying to mix wool and linen. “Thou shalt not wear a garment of divers sorts, [as] of wool and linen together.” Deuteronomy 22:11 Again, there is no command on what material the tassels are to be made with. But the reasoning is understandable. Now that we’ve gotten that out of the way, let’s look at other areas in Scripture where the tassels are mentioned. “The Sun of Righteousness will rise for you all who fear my name (shem: character, attributes), and HEALING is in it’s wings (kanaf) and you all will go out like stall fed calves.” In this case, Sun of Righteousness is figuratively speaking of the Messiah bringing healing in his wings. Wings in this verse could be referring figuratively to wings of a bird. But it could also carry a double meaning as that of tassels as we later see in Matthew listed below. “And behold a woman having a flux of blood came up behind him and touched the fringe of his cloak/outer garment (tzitzit), because she said within herself, ‘If I will only touch his cloak/outer garment (tzitzit) I will be healed.’ But Yeshua (Jesus) turned around and he saw her and said ‘Daughter take courage. Your faith has cured/healed you. '” Matthew 9:20-22 Knowing the culture and the context of what’s being said, we know that the bleeding lady was healed upon touching the tzitzit. This seems very similar to Zechariah where the people are grabbing the tzitzit of one Messiah believing Jew. Now let’s discuss colors. We know YHWH does nothing by accident. So let’s discuss some physics. White light consists of ALL colors. The sun gives off white light, a mixture of all the colors in the spectrum. The object appears yellow because the blue light is absorbed, while red and green are reflected and combine to form yellow. We see the color yellow. Gold coming from the color Yellow is often referred to as Negative Blue Light. Gold absorbs or retains blue. It does not reflect any Blue wavelength. If Gold & Blue wavelengths are combined, it creates perfect white light. The Shema is perfect. White is perfect in Scripture as it is the hearing and doing of God’s commandments = Purity/Holiness. ^With everything above, it is understandable how many CHOOSE to wear WHITE & BLUE threaded/knotted tzitzits. Finally, not everything Rabbinic is bad. The most common knottings for tzitzits have a great amount of Spiritual significance as they revert our attention BACK TO THE COMMANDS. I myself wear Rabbinic wrapped tzitzits as I find it to be much more helpful to me. Due to this, I figured I’d explain the common wrappings. There are five knots and 8 strands which total 13. 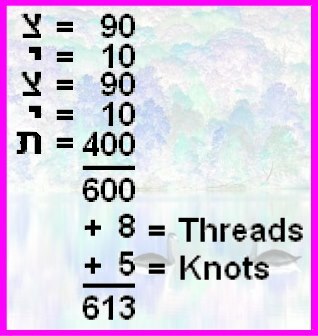 Therefore the numerical value of the tzitzit, the knots and the strands is 613. This is the number of positive and negative Torah laws. Next, we must consider the wrappings numerically. Following knot 1 there are 7 wrappings and following knot 2 there are 8 wrappings. The total of these two wrappings is 15. The number 10 in Hebrew is designated by the letter or consonant (yod). The number 5 in Hebrew is designated by the letter or the consonant (yod, hey). Thus represents the number 15 in Hebrew. Following the third knot (3) there are 11 wrappings- Six (6) wrappings plus five (5) wrappings equal eleven (11) wrappings. We must then designate the number 11 in Hebrew. The number six (6) in Hebrew is the letter or consonant (vav). The number five (5) is represented by the letter or consonant (hey) as previously demonstrated. Therefore, the seven (7) wrappings, the eight (8) wrappings, plus the eleven (I 1) wrappings represented by (6) plus five (5) spell out the following word: (yod hey vav hey) (YHWH) God’s Transliterated Name. Following the knot (4) there are 13 wrappings. The numerical value of these wrappings is somewhat more complicated. One (1) wrapping plus eight (8) wrappings plus four (4) wrappings equals 13 wrappings. One (1) in Hebrew is designated by the letter or consonant (aleph). Eight (8) in Hebrew is the letter(cheth) while the number four (4) is designated by the letter (daleth). The Hebrew word formulated by the 13 wrappings of 1 plus 8 plus 4is: echad (meaning ONE: unite- to join oneself together). 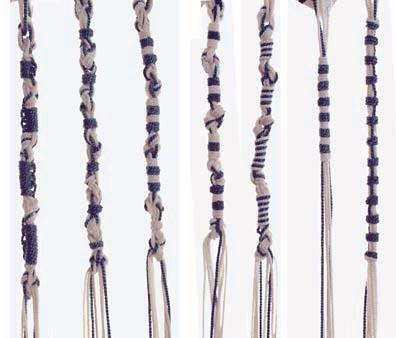 There are five (double) knots on each of the tzitzit tassels. In the spaces between these knots, one of the fringes – which is longer than the others – is coiled around the rest. Seven coils in the first space, eight in the second, eleven in the third, and thirteen in the fourth. These 39 coils have the same numerical value as “Hashem Echad” meaning God is One. The knots and tying is simply to remember the mitzvot. With that being said, try your best and remember to test EVERYTHING! Reblogged this on Into Yahweh's Presence.